“Frustration” no longer adequately describes what reformers in Congress – along with millions of investors and taxpayers who voted for reform – are feeling. For many, hopelessness is beginning to set in on the prospects for tax, budgetary, and monetary reform following Wednesday’s GOP capitulation on the debt ceiling. Democrats shamelessly exploited the Hurricane Harvey disaster to couple the $7.85 billion disaster aid package with demands on unrelated issues in the budget. Congress didn’t pay for the bill with offsetting spending cuts, as the Club for Growth and other fiscal conservatives had urged. Instead, this emergency spending (and more to come) will simply be added to the national credit card. If there’s any fiscal upshot, it could be for those holding contra-dollar investments such as precious metals. 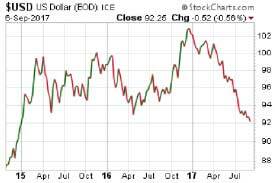 The U.S. Dollar Index has been in a downtrend all year. It may now have impetus to fall further. Months of legislative failure and inaction have caught up with Republicans. A recent Fox News poll shows that only 15% of voters approve of the job Congress is doing. Now – faced with a disaster in Texas and another one on the way in Florida that could inflict hundreds of billions of dollars more in damage – Republicans are being pushed by circumstances beyond their control. Their president has all but given up on them. He is, understandably, beyond frustrated with feckless Republican leadership on Capitol Hill. House Speaker Paul Ryan and Senate spoiler vote John McCain have seemingly devoted more effort to publicly criticizing President Donald Trump’s choices of words than passing GOP legislation. This week, President Trump foisted the “DACA” immigration issue upon a Congress that doesn’t want to have to deal with it on top of everything else now on their capitulation schedule for the rest of the year. Trump’s abrupt move left Americans confused as to what he wants Congress to do with President Obama’s illegal DACA amnesty directive. Trump had campaigned against it. Now apparently he wants DACA “legalized” in some form. The three-month extension could give conservatives another shot at attaching reforms to the next funding bill. But so far Republicans have been outmaneuvered at every turn by Democrats and the forces of more spending and more debt. President Trump’s decisions on Federal Reserve appointments in the months ahead will be critical. They will majorly help determine the outlook for interest rates and the value of the Federal Reserve Note, commonly thought of as the U.S. dollar. This week, Federal Reserve Vice Chairman Stanley Fischer announced he will resign from the Board of Governors by mid October. That will leave four out of the seven seats on the Board vacant, with one nomination currently pending before the Senate. President Trump will be able to put his stamp on the central bank in a big way with appointments, especially if chooses to replace Fed chair Janet Yellen after her term expires in February 2018. The Fed may get some new faces in the months ahead, but it’s very unlikely to acquire a new philosophy. The Keynesian philosophy of perpetual credit expansion enables all spending excesses out of Congress and therefore enjoys broad bipartisan support. Credit doesn’t equal prosperity. Credit adds economic value when it’s used to purchase productive assets, such as factory equipment. It doesn’t add economic value when it’s artificially expanded to bail out malinvestment prop up unsustainable government programs, or finance excessive consumption. It doesn’t add economic value when national debt relative to GDP has grown so high that new borrowing will have to occur just to service the existing debt. The Fed and Congress seem to be doing everything in their power to ensure that the value of the Federal Reserve Note “dollar” will go down. Indeed, they need it to depreciate in order keep Washington’s perpetual borrow-and-spend machine going. They hope it will depreciate in a gradual, orderly fashion. 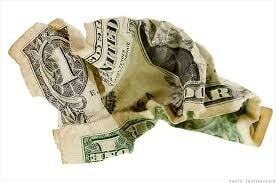 But confidence in a currency can be lost suddenly. If that should happen, a scramble for hard money in the form of gold and silver could commence suddenly.